autofire effect can be done manually but is pretty hard. By holding the button and releasing the MINIMAL time possible and holding it again (you have to have a good sensibility in your button) its possible to achieve that effect. For example Liu Kang and Jax moves that involve holding LK for some seconds. In the case of autoblock walking, its harder as you need your character to interrupt your blocking animation so you have to come from ducking or jumping I believe. these three blocks are meant to be somewhat like "you re almost not releasing the button" (like the video above) , right? Some combos deal less damage than what you would expect due to damage protection (reduced damage). In some cases the hit/damage percentage counter doesn't register the hits or damage correctly. 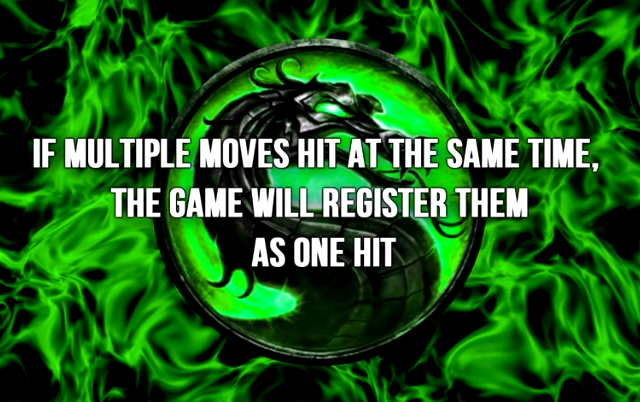 If multiple moves hit at the same time, the game will register them as one hit. Difficult to be more precise for the game? Special moves that don’t deal damage will give damage if they’re performed in a juggle with Damage Protection activated. CPU Mileena has unique pop-up combos. Human Smoke always fights on the Blue Portal stage against the CPU (except vs bosses). The input for Jade's Returning Boomerang doesn't work when you play against the CPU. Jade and Unmasked Sub-Zero's largest autocombos deal more damage when performed by the cpu. In some cases the CPU recovers faster than a player. Kung Lao doesn’t need to do a move between the spins when performing his corner infinite against Shao Kahn (the same applies to Motaro, but isn’t an infinite). Robot Smoke and Sektor can link two Teleport Uppercuts against Shao Kahn. Although in general Motaro is immune to projectiles, you can sometimes hit him with Sindel's Air Fireball and Jax's missiles. Player 1 Sektor can launch a straight missile while a homing missile is out, Player 2 Sektor can’t. Player 2 Jax can’t do his Dash Punch or Gotcha Grab while buffering his Ground Pound unlike Player 1 Jax. You can take advantage of Jade's Projectile Invincibility input and throw her boomerangs as well. You can break out of the dizzy animation caused by Kabal's Spin with any special move. Sometimes you can cancel the block and hit animation using special moves. Some projectiles have different speeds in certain instances. You can throw out faster single jabs by pressing and instantly releasing any button other than punches or directionals. In any given round one of the players (decided at random) has Frame Advantage (hit priority). The other player instead has a property called Glitch Cancel which allows you to land an extra hit before a special move locks. Players 1 and 2 have priority to remain in their own corners. You can throw punches while holding block and the character will block automatically when hit (glitch jabs). The timer counts down slower in 2on2 mode. You can reach a fifth round at most. In this round there is no Finish Him/Her sequence and the game ends immediately. There are many instances when a character can’t block a certain attack when on the ground. In 2on2 mode throwing the first character of the team as soon as they're defeated can take damage off the second character. In 2on2 mode you can catch your opponent's second character with a spear if you do it as soon as you finish the first, although it can be avoidable. If you counterattack with a special move the next hit can be unblockable. You can land the Jump Punch or Straight-Up Jump Kick as you’re ascending into an autocombo. In some scenarios autocombos stick before completion and can be easily punished. During jab pressure, Stryker can't take or give chip damage against certain characters due to his hitboxes. Some of the autocombos that start on the ground can whiff in certain scenarios. Some characters can’t link their jump starters with a punch, a kick or both against female ninjas (although some can in the corners). Some moves don’t hit when performed by both players at the same time while using specific characters. Reptile’s Forceball can hit Robots and Sheeva when flat on the floor. Some characters can duck underneath some of the characters’ uppercuts. In certain situations against some characters, the slide only pushes them and causes no damage. Something similar happens with Kano’s Horizontal Cannonball. Some characters can avoid Sektor’s Homing Missiles by simply crouching. You can hold block before the round starts and still perform a Babality/Friendship. Shang Tsung can’t morph into Robot Smoke. When crouch-blocking attacks, sheeva won't stand back up if you release the down button while continuing to hold block. In certain cases, some moves take longer to recover. Although starting a ground combo with low/high kick is the same, you can't chain an autocombo off the low kick from the air. 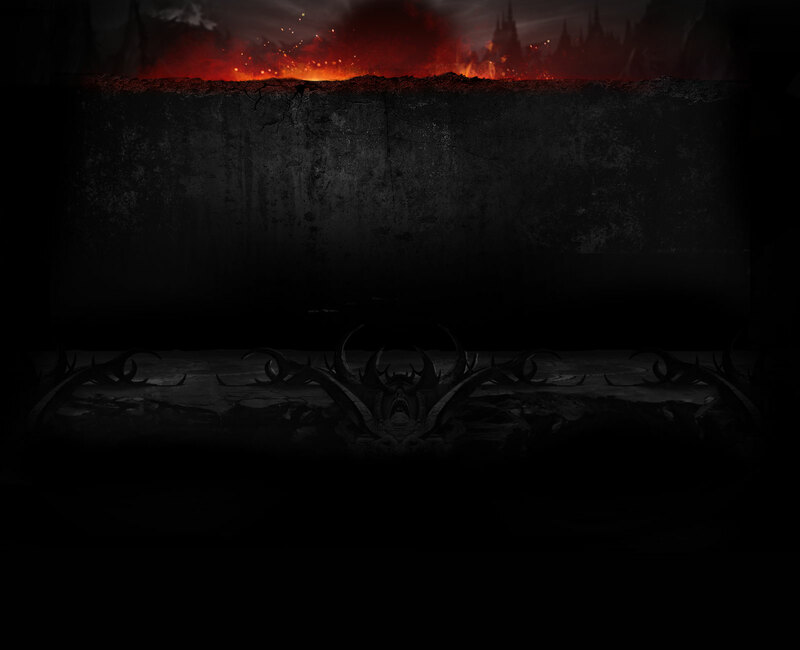 Some stages appear multiple times before other stages appear even once. In 2on2 if your first character dies after doing a Mercy you will lose the match, even though you still had another character left. Sometimes when you appear to be right next to your opponent, they can't be thrown. Ermac turns invisible when hit by some moves like Liu Kang’s Bicycle Kick or air throws if he does a teleport at the same time. Reptile doesn’t reappear after repeating the Invisibility input once he is invisible, Robot Smoke on the other hand does. Invisible characters don’t become visible when you air throw/bike kick them, even during Fatalities. Shang Tsung can’t auto-morph in the Randper Kombat mode, but the names still change in the lifebar. There are three autocombos that are incomplete. The game slows down for a short time when a Mercy is performed on The Subway or The Street stage (after ascending to it). Starting a 2 player match after performing a Mercy against the cpu (but before finishing them) will cause the Mercy to be buffered, allowing you to perform an animality during the next Finish Him/Her sequence regardless of criteria. In a 2on2 team if the second character is a male ninja they will have Reptile's stance at the round start. In the case of robots, Cyrax's stance can be seen and female ninjas have Jade’s stance. Unmasked Sub-Zero remains in a weird stance after doing his crouching High Kick move. If you finish Kabal with a sweep, the animation of him falling down doesn't complete. Occasionally Ermac’s 2-hit pop-up misses and you can see his axe. Perhaps they added an axe from him that dont use? Sometimes you can see a spear going past the opponent's sprite when it hits. You can confuse a Mercy by doing some special moves before it. You can do infinites against Shang Tsung by taking advantage of his morph-back state. During the Cyrax/Kung Lao endurance you can disappear off the screen in the middle of the fight. Infinites with crouching low kick/punch are possible in the right corner. When you hover over Shang Tsung on the select screen with Player 2, all the characters on the Player 1 cursor will have the alternate costume. When the same character is selected on both sides the costume is the same. Some characters don’t have the alternate costume on the vs screen. The new characters for UMK? Player 2 Human Smoke has the same color palette as Player 1. As I said above being a exclusive character they forgot to treat it like a normal one. Sometimes the screen shakes when a character is frozen/spun in the air. 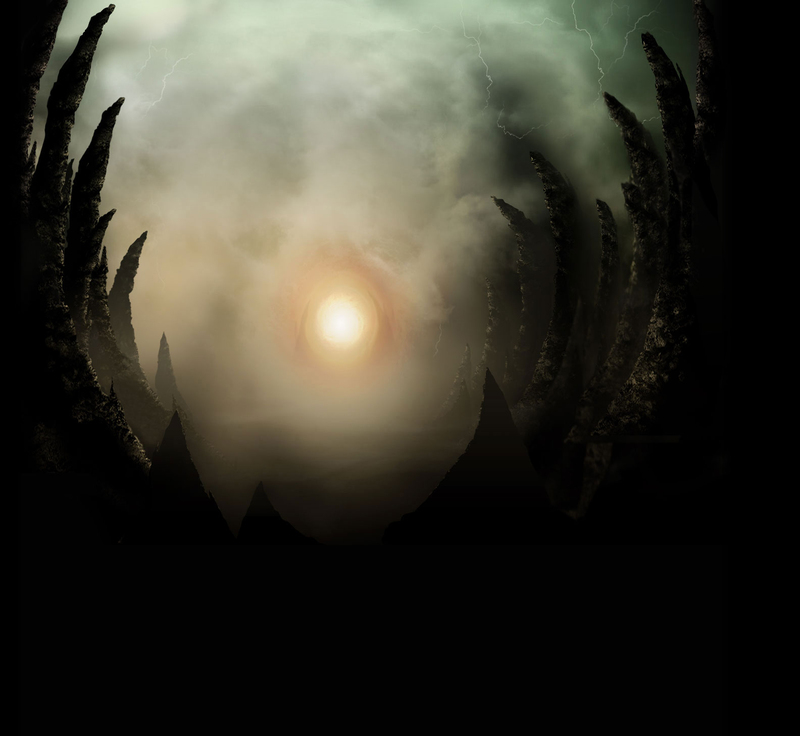 The smoke that rises from Human Smoke disappears when you ascend to a contiguous stage. With some special moves character palettes can be switched mid-match in 2on2 mode. In some cases arrows appear around the characters. In some cases parts of the HUD disappear when a large number of sprites are present. The majority of stages have graphical flaws. A Mercy can cause fluorescent colors on robots. When you do a Mercy on Jade's Desert or The River stage, part of the sky turns dark. Robot Smoke has the wrong colors when a Babality is performed on him. Some about his secret character issue from MK3? Scorpion and Human Smoke's "GET OVER HERE”/”COME HERE" gets cut out by the sound of blood splatter. When Nightwolf reflects Reptile’s Acid Spit with his Glow Shield and it hits Reptile, you can hear Sindel’s Scream. When fighting Motaro some out of place sounds can be heard. If you select your character just before the time runs out, you will hear the name twice. There is no announcer audio when Human Smoke or Classic Sub-Zero perform a Mercy. There are many ways to end a match with your opponent off the screen. The losing player can throw some normal moves after defeat. On Finish Him/Her, you have faster uppercut recovery enabling you to do some unique combos. I dont know if that was on purpose or not. But was a very nice decision IMO. As you re not really fighting at that point, you have broken rules to be more fun. After defeating your opponent you can crouch-block indefinitely if you press the down button at the right times. The losing player can do it too. Perhaps something memory saturation related? And can cause a glitch when performed against robots as well. Some Fatalities can glitch some characters’ costume palettes. 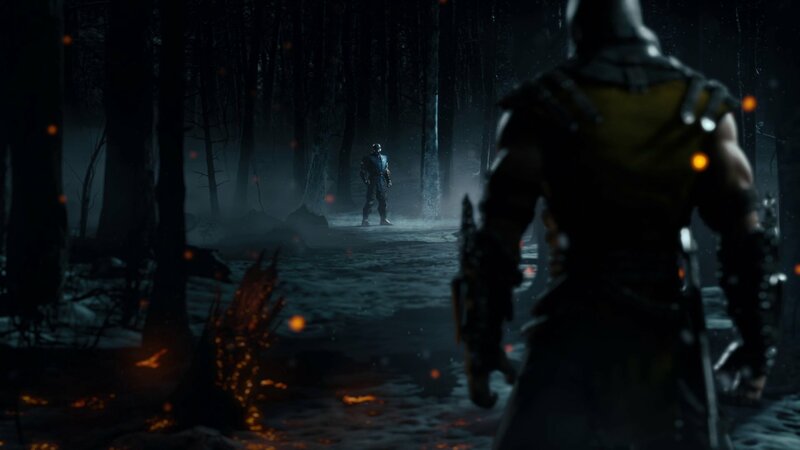 Shang Tsung appears in the darkness after morphing into Classic Sub-Zero and performing his Spine Rip Fatality. Half of the ice disappears from Unmasked Sub-Zero’s Overhead Ice Smash Fatality after morphing back into Shang Tsung. Nightwolf’s abduction Fatality leaves some sparks in the air when performed against Cyrax or Sektor. The jump height is not always fixed. The character's movement sometimes gets altered after a stage transition. The floor is higher on blue portal and the pit III allowing you to do specific combos.